Gift in style with our dapper glen plaid toiletry bag for your best man and groomsmen. 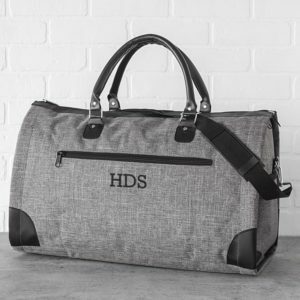 It’s the perfect present for the frequent fliers and dapper dandies of the bridal party. Free Personalization: We’ll embroider the toiletry bag with up to three initials in black thread for no extra cost. 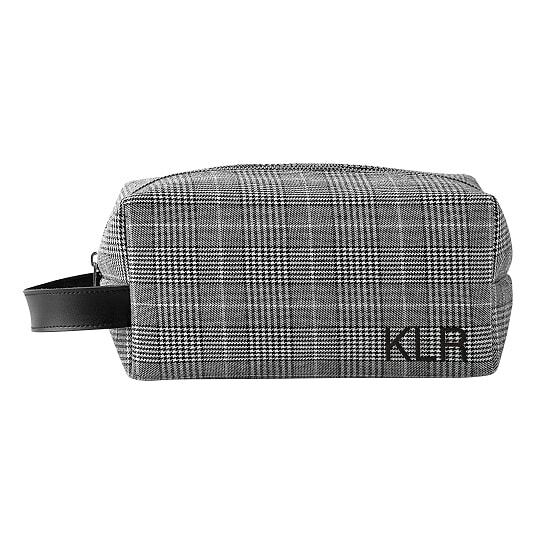 Our Personalized Glen Plaid Toiletry Bag is the perfect present for the dapper dandies in your wedding party. 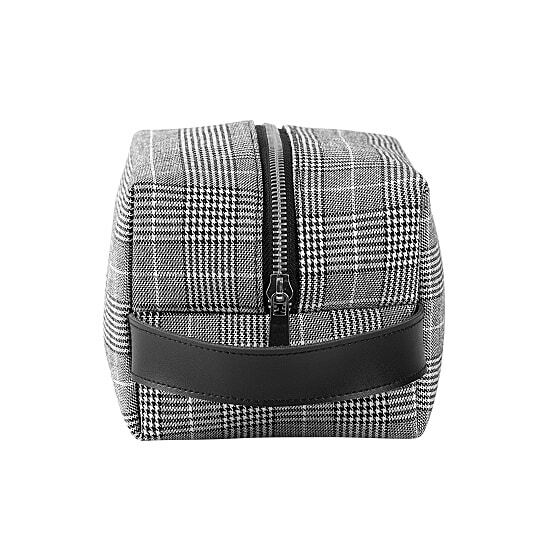 Both classic and classy, this toiletries bag features a genteel glen plaid exterior, a wide zipper opening, and a convenient leather side handle. Easily spot cleaned and air dried, this gift is easily maintained. It’s also perfectly sized for grooming tools and accessories. 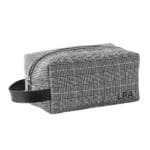 Whether it be for business trips, vacations, or even your upcoming honeymoon, our dopp kit is an amazing gift for any man who loves to travel! 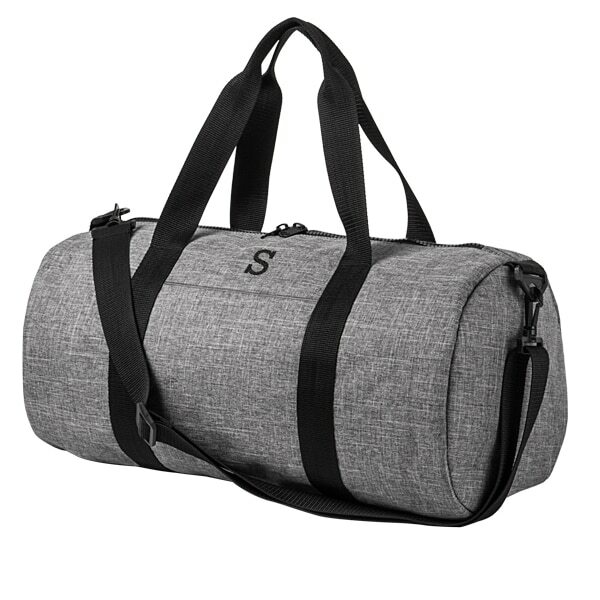 We will embroider the front with up to three initials at no additional cost. Toiletry bag: 8.25" L x 4" W x 5" H.
Handle: 6.25" L x 1.25" W.
Glen Plaid fabric and PU black leather construction. 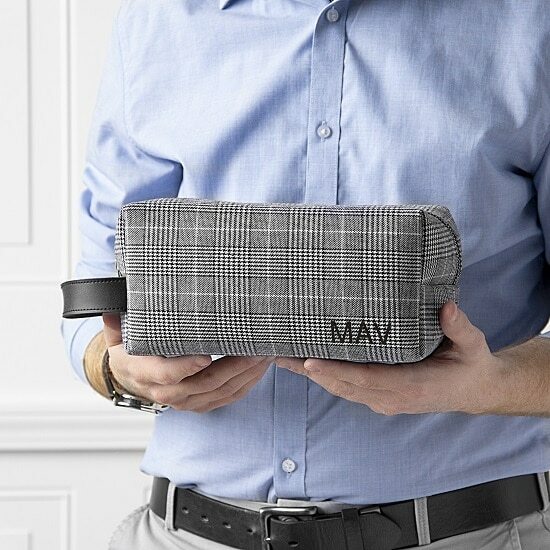 My husband wanted these as groomsmen gifts and he loved the quality and materal: it's a neutral color but it's got a little bit of extra, in that it's the plaid. It's softsided but not saggy, and it matches everything. The monogramming allowed for a personal touch for each of the guys -- this is definitely a gift he couldn't have gotten just anywhere. Definitely would purchase more from The Man Registry!